My mother taught me how to sew when I was a child. As an adult, I picked it up again and really admired quilts. 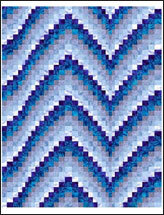 I picked up a bargello quilt book and I have been hooked on creating my own bargello quilt designs ever since. 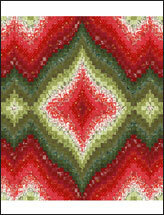 I absolutely love designing bargello quilts. 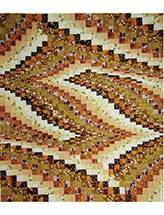 I am best known for my bargello quilt tops and patterns. I am honestly not sure -- as I lie down in bed at night new ideas for bargellos always pop into my head! 5 On average, how many new patterns do you design each year? 20+, but I always have a hard time naming them. 6 Is there another craft you’d like to try your hand at? Drawing and painting. I have tried them before, but with not-so-good results, so I guess I will stick to my quilts. 7 What is your favorite way to spend a Sunday afternoon? Just nice and lazy in front of the TV. 8 What three items do you always have in your craft bag? Rotary cutter, thread and ruler.